Employment Growth of Digital Media & Entertainment Industry Cluster | Propel L.A. 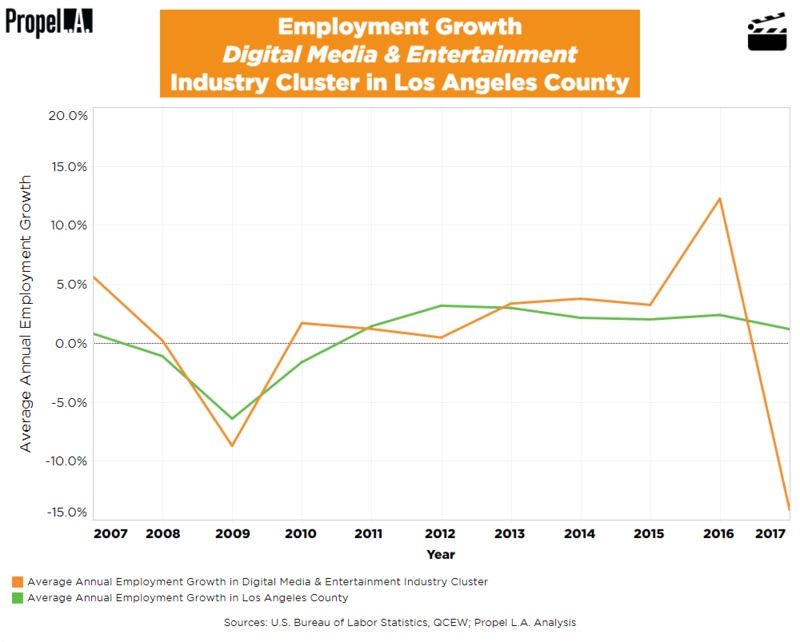 The Los Angeles County’s Digital Media and Entertainment Industry Cluster (“DME”) industry cluster (“DME”) has experienced a highly volatile employment growth rate. Most recently in 2016, employment increased by 12.2%, but in 2017, it then decreased by 14.1%. For comparison, the green line represents the average employment growth of the whole county, irrespective of industries or clusters, which averages at about 0.6% over the past 10 years. Any rate below 0%, even if greater than the previous year, still indicates a decline in employment. Overall, despite the volatility, industry leaders believe DME has and will continue to experience strong employment growth. There has been a 12% increase in jobs since 2006, and there is predicted to be a 7% increase in jobs over the next five years. Chris Rico, LAEDC’s Director of Innovation and Director of Entertainment & Digital Media Industry Cluster Development, attributed much of the employment growth to “streaming companies like Amazon and Netflix, which have large and expanding operations in Los Angeles County” (Los Angeles Times, February 2018). Annual employment growth was calculated by dividing the change in number of employees between two consecutive years by the number of employees in the preceding year within all he selected NAICS industries. Calculations only account for private ownership. NAICS industries were selected by using the definition of the industry cluster in the Entertainment and the Rise of Digital Media in the Los Angeles Basin report (Center for a Competitive Workforce, LAEDC, January 2018). Due to large population size of NAICS industries in the Digital Media side of the DME cluster, Propel L.A. selected three through random sampling to represent this subset of a larger DME population. The summary of results may be slightly biased due to the NAICS industries being nonexhaustive. To learn what the Digital Media and Entertainment Industry Cluster industry cluster or an industry cluster is, read here.